Galmisdale is the point of access for the island of Eigg, at 8km by 6km the second largest of ‘The Small Isles’, occupying the area between the Isle of Skye to the north and the Ardnamurchan peninsula to the south. Eigg has a population of over 60 inhabitants. 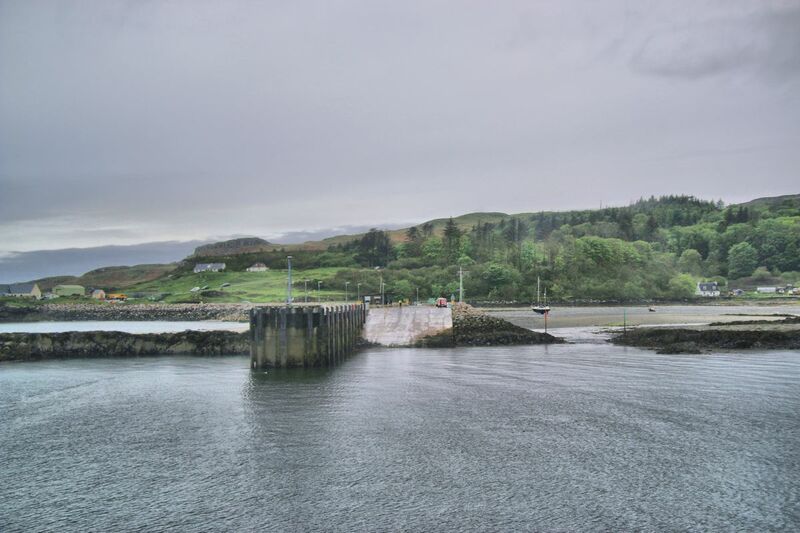 Ferries operate from Mallaig and, seasonally, from Arisaig. A new ferry terminal was completed in 2004, by building a causeway across the bay. 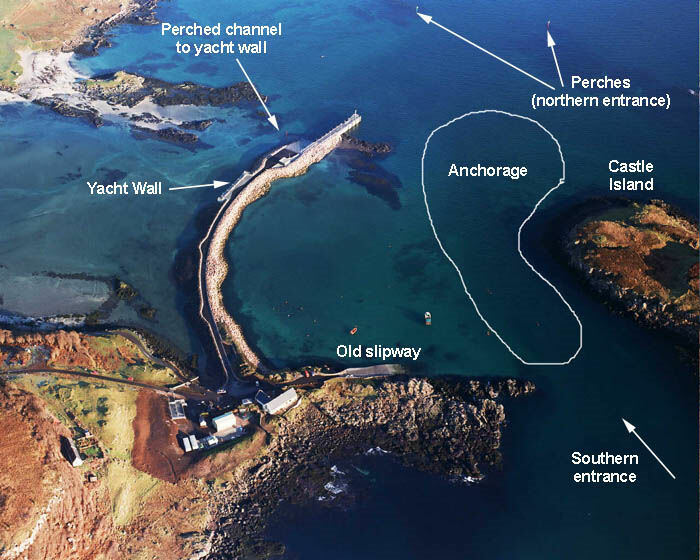 There is a 50 metre vertical wall on the inside face of the causeway designed specifically for yachtsmen. This has a firm smooth bottom for drying out, mooring bollards, access ladders, lighting etc. Approach from the north east leaving the new slipway to port, and pass between the smaller perches to come up to the wall. The depth gauge on the side of the new slipway shows the water depth above chart datum. The depth between the inner perches and at the yacht wall is 1 metre less than this, having been dredged to one metre above datum. The main anchorage for yachts is to the north-east of the pier at Galmisdale Point. There is always depth in the channel but the bay to the west mostly dries at spring low tide. There are a few private moorings which leaves limited space for anchoring so a tripping line is not a bad idea. The spring tide sets quite strongly through this channel. When approaching from the north-east, approach between the two new (and lit) perches, and keep open water between Castle Island and Galmisdale Point ahead. This will keep you in the deepest part of the channel, which is at its shallowest just south of the port hand perch. If you are coming from south, keep clear of the south shore of Castle island, as the reef extends some way offshore. If the wind is in the north to east sector, it is quite safe to anchor in the south bay behind the old pier point. In calm weather it possible to anchor in Laig Bay on the west side of the island. Access to what has become the inner harbour, which dries completely at springs, is by a marked passage to the north-west of the new ferry slipway. See here for a plan of the harbour. The last two photos in 'More Photos' above are of the old harbour, which dries at low water.